After the Doctor goes to see the critical systems he goes, "And there you are." Further emphasising that he knew about the tech before. I know we all think that now but meh. Secondly, is Amy Pond stupid or what? Weird Crazy Lady: "Fully programmable matter. In fact it's even learning to replicate itself at the cellular level." Or has been the whole time. Yeah apparently wherever he goes, it's meant to be a carefully concealed trap. It would have to be significant considering it was a previous title for the episode. More casting stuff for episode 7. True, but then the question of when arrises again, could she even have been taken back before she went travelling with the Doctor? 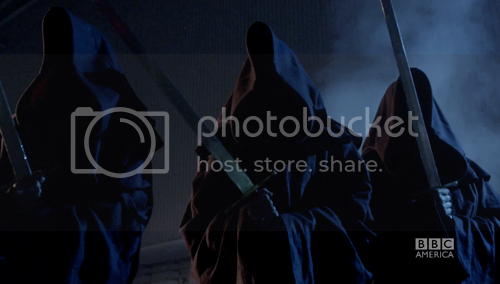 Oh dear, it's the Nazgul, Dr Who meets LotR ftw! If it is meant to be a trap maybe for the Alliance as with the whole Sontarans and Dominicus (such a Roman name ), that really just confirms to me that the Alliance is back, minus the Daleks unless the Moff lied about them not being in this series. The Autons are back with the Romans and so it could be Rory pretending to be an auton to the Cybermen in that picture as I've said before. If it is the Alliance it could be pre Pandorica and they then ally with the Daleks and go back in time and do that. Or it could be future Alliance. Or the Alliance has been reset and so might have this different plan to trap the Doctor now there are no more cracks. Of course that leaves the question of just why are they trapping him then? Sorry letting my thoughts run away with me. It may not be rocket science, but it is a bit complex for a 7 year old. Somebody has to question it so it can be explained. If she has been cloned, I think she might have been taken in that 3 month gap where they were being hunted down? Wherever she is, another theory could be that she is unaware she has been taken. To put it like this, if there is a psychic link between her and her clone, she might be controlling her clone (like those factory workers) but just not being aware that she is in fact locked up with Kovarian. The Alliance can't be acting in their own capacity. I know several members have said that they might be clones or some other creatures in disguise. I think another possibility is that the Silents manipulated them into making the Pandorica and trapping the Doctor. The Silence has to be the bad guy for episode 7. But I've not heard of any reports of them appearing until 13. But a snippet from Moffat said they (the Silence) had been laying a trap for the Doctor, and it would be revealed in episode 7. I can't find that snippet though to back that up. As for the Alliance laying a trap. That would be a boring repeat of last year's finale, Moffat is probably better than that. Especially after all these teasers about the shocking events still ringing in your ears, the revelations concerning River Song and Amy and the game-changing cliffhanger. Could the Doctor be leading the Alliance, even forming it himself, to go to war with the Silents? Now that would be interesting and would explain the whole no Daleks. "Oh great. That is so typical me." If I understand you correctly, what you're implying could explain the very strange and unexplained event earlier in the series. Rest assured I will be watching this space! "I want silence in my head"
She knows Amy from elsewhere than the Tardis surely? As she came to the wedding, how did she still remember Amy if the Doctor's timeline never happened? I think a better question may be why did she come to the wedding? If you say to deliver a diary and she remembered The Doctor the same way Doctor remembered Rory, then fair enough. But why stay hidden at a wedding until it's dark and the dancing is over? Of course, if you've read spoilers then answer to this may be clear. Or of course the obvious one, how did she get there? Did she go once again and get a vortex manipulator? With delivering a diary, did the Doctor during that 3 month visit pay her a visit and give her the instructions to go? How would she have known to go otherwise? Doctor Who TV have now went and put up the Daily Star spoilers I mentioned yesterday. Bit slow aren't they? Avoid clicking. Not sure how true. Just remembered reason I even came on here. How did Nephew (Ood) get onto the Tardis? Just realised that in Day of the Moon, Amy is running in Valley of the Gods, Utah. probably not significant, but speculating about stupid theories is better than revising for A-levels. Don't remind me, I bloody well LIVE in Milton Keynes and I still can't go because of work!